When we decided to create a flavored whiskey, we agreed that we would never compromise quality for taste. We searched for the finest bourbon we could get our hands on (there’s a shortage of it, in case you hadn’t heard). After a whole lot of testing…and tastings, (it’s a tough job, but someone’s got to do it!) we knew we were ready to add our herbs. How did we know what to use? We maintained our commitment to quality and located the world’s most beneficial, all-natural herbs including white tea, hibiscus, green tea, eucalyptus, fennel, bitters and a hint of cinnamon. The result: a fragrant, slightly sweet, semi-tangy, totally smooth and completely unique flavored whiskey. COLDCOCK is easy to drink on its own, chilled or at room temperature straight up. We also like it on the rocks or in a cocktail with mixers such as ginger beer, lemonade, soda with lime or with coffee and cream. COLDCOCK is all natural, gluten free and low in sugar/carbs. We believe that life is about taking your shot at doing what you love with people you enjoy working with. We also believe that hard work is the ultimate reward and selling out is never a option. 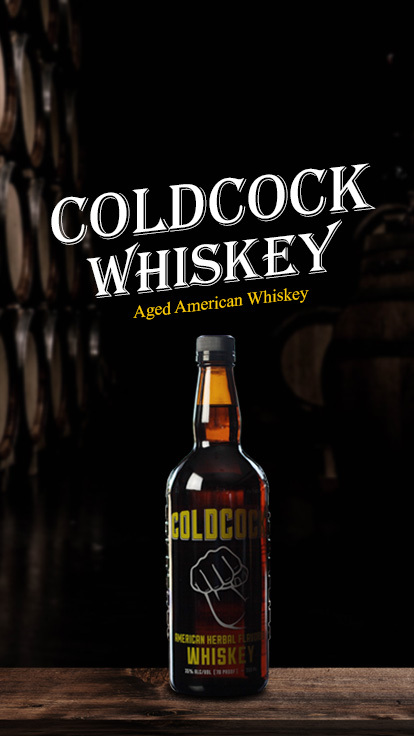 COLDCOCK was created by a family of musicians from all genres, agents and managers, world famous action sports athletes and distilled spirits industry veterans. Collectively, we have built some of the most successful bands, brands and events in history. After years of building brands for corporate giants, we decided to create our own one-of-a-kind spirit, for our own enjoyment and to share with the ones we love. We invite you to try the world’s first and only herbal whiskey.